Stephanie Chitu (pronounced key-too), our new kindergarten teacher, has spent her career teaching in the public school system and homeschooling her own children. SLA is the fourth school she’s taught at and the first one that is a Christian school. “It’s been the best place I’ve taught so far,” says Mrs. Chitu. A lifelong Southerner, Mrs. Chitu and her family moved to Massachusetts from Georgia in May 2016. Her husband, Ben, was working as a paramedic and taking classes to become a physician assistant (PA). They were interested in a PA program in Manchester, NH and visited the area. They decided SLA was a good fit for their children as well and moved here. Their two oldest children, Scarlett and Landon, began attending SLA last year, and now are in 5th grade and 2nd grade. Their youngest, Bella, began PreK this fall. “Then this opened up and it seemed like the right time to apply. Ben wasn’t working; he’s in school full-time, so I felt like God opened up the door for me to come and have the position,” says Mrs. Chitu. In addition to teaching and raising her children, Mrs. Chitu is an avid ice skater. She began skating when she was 17, progressed through all the levels and became a coach as well. She performed in The Nutcracker on Ice for a few years in Tennessee. She even had the thrill of performing in it when it aired on PBS one year. Mrs. Chitu continues to skate most Sunday afternoons with her family. They also enjoy hiking, camping, biking and visiting sites in New England. 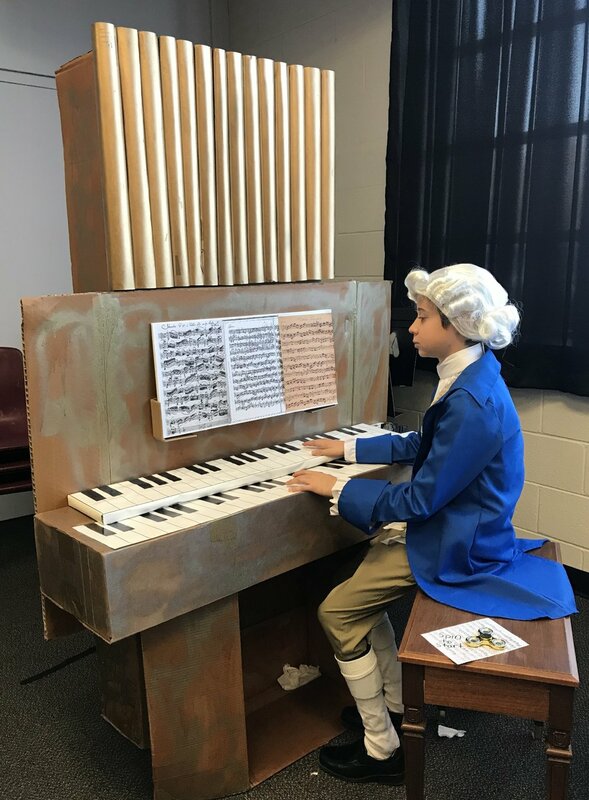 The sixth graders wowed the students, parents and staff with their creative costumes, props and presentations as historical figures at their annual wax museum event. The students each chose a person from history to study. They had to research the key information about their chosen person, create a display, design a costume and memorize a speech that they prepared as if they were that historical person. When a visitor came along to push their “on” button, the student came to life as that character. Brianna Small received 1st place for her presentation as Queen Elizabeth I. “I love that we got to dress up as the character,” said Brianna Small who received first place as Queen Elizabeth I. In addition to retention, the wax museum experience teaches kids research, presentation and speaking skills. Some of them even differentiated their speech depending on their audience, whether that be kindergarten students, academy students or parents. The students were graded based on a clear list of requirements and awarded first, second and third place recognition. The judges were Principal Jeffrey Lambert, Vice Principal Theresa Robidoux and SNEC Education Superintendent Beverley Bucknor. “I hope my character was an inspiration because I like music,” said Lucas Barbosa who got third place as Johann Sebastian Bach. 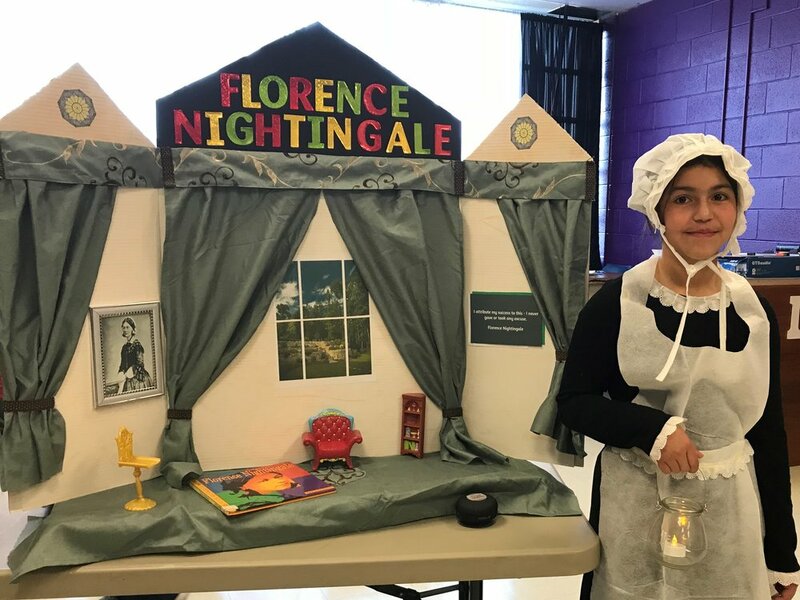 Camila Morales-Fernandez received 2nd place for her portrayal as Florence Nightingall. Lucas Barbosa, as Johann Sebastian Bach, took third place. South Lancaster Academy students took part in the Greater Lancaster Holiday Gift Baskets and Food Drive that provides food for the Thanksgiving holiday to families in need in the Lancaster area. They provided enough food to feed 1,037people, in more than 300 families, for one week. Each year, students participate by helping to prepare bags, sort and pack boxes of food, as well as make cards for each family.